How UK support is helping Somali women have safer childbirths. Farhiya Jama Ahmed with her son, Abdisamid, who was safely delivered thanks to the skilled medical help she received. Picture: Save the Children. Farhiya Jama Ahmed lives in Puntland Somalia with her husband and 3 children. Like most others in the region, Farhiya and her family have survived endless cycles of calamities, from constant clan-based conflicts to famine and diseases. Over 20 years of conflict has left Somalia with some of the worst health indicators in the world and a shattered health system. However, support from the UK is turning things around for Somali women like Farhiya. When she was 7-months pregnant with her last born, Farhiya and her unemployed husband, 47-year old Abdulkadir, moved their family from Qardho town in Karkaar region to Kalabary, the husband’s village where life was generally more affordable. Two weeks after the relocation, Farhiya fell sick. “I started to feel unwell with back pains, fever and nausea. With financial help from well-wishers my husband took me to Gardo Hospital where I was treated and asked to come back when birth was due” says Farhiya. However, Farhiya was aware that the request from the nurse for her to come back and deliver her baby in the hospital was too difficult to honour - the hospital was over 100km from her village and she had no means of transportation to get there. Before she could fully recover, Farhiya’s sickness returned, this time more severe and accompanied by labour pains. As fate would have it, her husband was visiting family several miles away so unable to even rise from her sleeping mat, Farhiya sent her 6 year old son to look for help from a traditional birth attendant. The traditional birth attendant initiated birthing procedures - skills she had picked up from her late grandmother - which remain the only lifeline for many pregnant women like Farhiya in her village. However, none of the prescriptions seemed to ease Farhiya’s pain. As the dawn call for players reverberated from a local mosque, Farhiya was still squirming in pain. The traditional birth attendant had heard of a project that helps mothers with difficult child births by getting them access to skilled medical care, she knew their help was urgently needed to save Farhiya’s and her child’s lives. Farhiya was taken to the nearest health post and within a short time the team was attending to her. “We found her really debilitated; we realised her life was in great danger and because she had ruptured the amniotic sac her baby was in danger also. We immediately decided to refer her to Gardo hospital”, explains Seid, the community health worker at the health post. After a 2 hour drive, Farhiya arrived at the hospital accompanied by a community health worker. The DFID funded Health Consortium Somalia (HCS) Project in Karkaar has a voucher system that covers transport costs, allowances and medical care of any mother referred for complications during child birth. 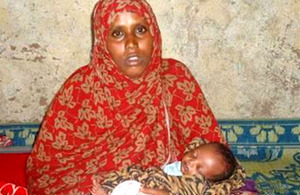 Farhiya was admitted to the hospital maternity ward and hours later gave birth to a baby boy – who was lucky to be alive. After 2 days of care Farhiya and her son, named Abdisamid, were discharged and allowed to go home. While Farhiya’s is a real life story with a happy ending, many women in Somalia are not as lucky. With a maternal mortality rate of 1,400 per 100,000 births, Somalia’s women are considered among the most high-risk groups in the world. DFID is funding the Health Consortium Somalia (HCS), the largest NGO consortium in health and nutrition in Somalia, to support their innovative approaches to improve health care provision. The HCS delivers services in discrete regions as well as supporting wider human resource development and ways of working through the private sector. New UK support will treat 8,400 more young children suffering from acute malnutrition, ensure 4,500 mothers can give birth with the help of a trained health worker and fully immunise 5,300 babies from deadly diseases such as diphtheria, whooping cough and tetanus. A woman in Somalia is 300 times more likely to die as a result of pregnancy and childbirth than a woman in the UK. Female Genital Mutilation/Cutting (FGM/C) is almost universal (98%), and contraceptive prevalence is only 1%. Haemorrhage, prolonged and obstructed labour, infections and eclampsia are the major causes of death at childbirth. The main underlying causes include very poor coverage of skilled delivery (over 95% of women deliver at home assisted by untrained traditional birth attendants or relatives), poor antenatal, delivery and postnatal care coverage, lack of emergency obstetric care and referral challenges. A high prevalence of anaemia and the cultural practice of female genital mutilation further aggravate the risk of maternal death.